A little over three years ago I started experiencing issues with my eyes. I would wake up in the mornings and feel like little demons were jabbing red-hot pokers in my eyes. You know how it feels when you get an eyelash or some grit or something in your eye? Multiply that by a hundred. Red. Hot. Pokers. After a series of visits to the optometrist and ultimately a corneal specialist ophthalmologist, it was determined that I have Map-Dot Fingerprint Dystrophy (or basement membrane dystrophy). The way the ophthalmologist described it: under the five layers of epithelial cells on the surface of the eye is a membrane that on most people lies smoothly. My membranes (the basement membrane) do not adhere very well to my eyes. My eyes get too moist, and when I open them upon waking in the morning my eyelids cause the basement membranes to slide and bunch up. Sometimes this will result in just a little bit of discomfort (like an eyelash in the eye) and sometimes it is unbearable. On those occasions I pretty much can count on my vision being messed up for the rest of the day, if not longer, as that bunched up membrane interferes with, you know, SEEING things. It is very disconcerting. 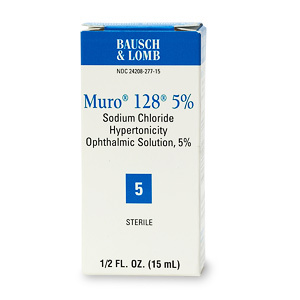 So, a little over three years ago when this was diagnosed, I was given instructions to religiously use Muro 128 ointment at night, and drops four times a day for three weeks. These drops are a 5 percent saline solution. For reference, ocean water is something like 2.5 or 3%. Suffice it to say the drops do not create a soothing feeling. I followed the doctor’s instructions, and when I returned for my follow-up, I was told that we would be able to avoid “removing the membrane.” I chose not to press too deeply on what THAT would entail. I would need to continue using the drops and ointment to keep the issue at bay. Yeah, so since then I had two babies. At the same time. I was pretty good about using the ointment at night when I was pregnant, but once Miranda and Henry were born there was no way I could use it as it severely impacts my vision (imagine petroleum jelly in your eyes) at night and well, babies gotta drink their milk. When they started sleeping through the night I was already out of the habit of taking care of my eyes. I would still keep the drops by the bed to use in the mornings on those occasions when the gritty feeling would surface, but for the most part, I was doing pretty well. 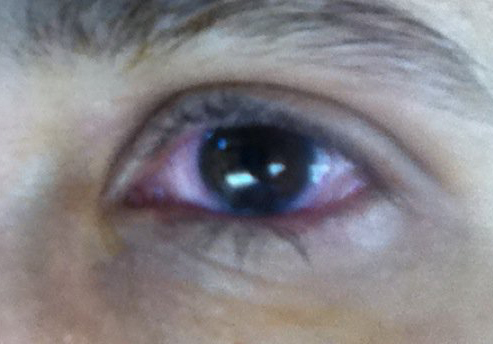 Until a couple of months ago when both eyes (especially the left) were hit hard with a big fat dose of corneal reality. I spent a couple of weeks with impaired vision and pain. The ophthalmologist had to look at my eyes for about three seconds before stating that it was time. I definitely needed to have the damaged membrane on my left eye removed so a healthy one could regrow and give me relief and my full vision back. Superficial Keratectomy is the name of the procedure, and I had it done today. I sat in the waiting room, my legs nervously bouncing up and down. On the car ride over, I had told Jack that I was feeling nervous enough that my stomach was a little upset. I honestly hadn’t felt that physically nervous about something since the little ones were born. As I was sitting there, clearly shaken, the receptionist walked over with a Valium and a cup of water. “This will help,” she stated. And it did. By the time I was brought over to the surgery center, my legs had stopped shaking. The procedure itself was very quick. Numbing drops were put in my eye, and the skin around the eye was rubbed with betadine. More numbing drops, and then a sheet over my face with a hole cut out for the eye (they had adhered this thing to either side of my chin to keep the sheet from falling down on my mouth asphyxiating me). My eyelids were held open with some special eyelid-holder-opener-thing, and I was told to look into the bright, bright light. The doctor started to remove the tissue with an instrument similar to a tiny spatula, and remarked that the membrane was so incredibly loose he hardly had to work hard to take it off. They had to put more numbing drops in at one point when I could feel what was going on (I seem to have a high threshold for numbing agents), and it was at that point that I realized I was barely breathing, and asked the nurse to hold my hand. I could see the whole time, and let me tell you — weird! Imagine that you are looking super close up into a slightly foggy glass lens smeared with petroleum jelly. Then imagine that you can see the petroleum getting scraped away — really really close up. Top that off with Mariachi music playing in the background (a favorite of one of the nurses), and it made for a surreal experience. Left eye post procedure. Traces of betadine stuck in an eyebrow that seriously needs to be waxed. I left the office — a little woozy from the Valium — extremely hungry, so Jack took me out to lunch. I kept waiting for this pain I was told I was going to experience, but I wasn’t feeling anything — maybe just a little irritation. I thought — dude! I can handle this! I won’t need to take the Vicodin they prescribed! Regardless, Jack stopped at the pharmacy on the way home to pick up the prescription. He dropped me off at home, and then headed back out to pick up Ethan to take him to his first summer evening chess class. I kicked back on the couch and two squishable two-year-olds joined me. Mommy! Mommy! Wape up, Mommy! Christine, “on duty” until Jack returned with Ethan, took them outside to play and have dinner. Three hours after the procedure I was thankful we had picked up the prescription. The all too familiar red-hot stabbing poker feeling was there, along with dull, throbbing pain in my eye as well as the socket, and my eye was watering uncontrollably. When I have the right eye done, I’ll be taking the Vicodin before actual pain sets in, because eye pain? Not so great. Once the Vicodin fully kicked in I started extolling its virtues. I go back tomorrow for a quick follow-up, and then in a week to get the contact removed. While it is still in there, I am to use two different eye drops four times a day (an anti-inflammatory drop and an antibiotic drop). After the contact is removed, it will take up to three months for the new basement membrane to fully grow back, during which time I am to use the Muro 128 drops and ointment religiously. My eyesight will fluctuate during those three months, which is why we will wait until September to do this all over again on the right eye. Now if you’ll excuse me, I am going to go collapse in a big heap and sleep as hard as I can.